Did you know antiperspirant’s active ingredient is aluminum? That’s how normal, store-bought deodorant works. Aluminum compounds temporarily plug the sweat ducts in your arm pits, thereby stopping the flow of sweat to your skin. Honestly, I had no idea until I heard a rumor that antiperspirant deodorant can cause breast cancer. I also heard it can cause Alzheimer’s. So I did a little research and yeah, if you look at the back of normal deodorant sticks, you’ll see aluminum as the main active ingredient. I also found that there are a lot of studies slowly proceeding to gather data on the long term effects of antiperspirant deodorant, but nothing has been proved so far. They cite this information as Darbre, PD. Aluminum, antiperspirants and breast cancer. Journal of Inorganic Biochemistry 2005; 99(9): 1912-1919. Then they link to an abstract on pubmed.gov. However, the overall point of article is that there is no conclusive evidence that antiperspirant deodorant leads to breast cancer, and that studies thus far have provided conflicting results. The FDA, of course, claims to have no research data or evidence that antiperspirant deodorant causes cancer. That doesn’t surprise me. I’m a little skeptical about the FDA. On one hand, I think they serve an important function. One of my best friends is a compliance consultant, so he makes sure medical companies comply with FDA regulations, and from what he’s told me…yeah, the FDA is pretty important and we should be happy they do what they do. On the other hand, the owners of the health food store in Danville, Country Store Health Foods, will tell you that the FDA is responsible for all sorts of deaths in this country because they’ve let things slide thanks to money and politics. Admittedly, they showed me that the FDA approved, Meijer generic pre-natal vitamin I was taking had a difficult-to-digest form of iron in it. So this rock form of iron was going right through me and doing me no good. In fact, my body was probably getting stressed by trying to digest it. There are forms of iron that our systems can digest, so I started taking a prenatal vitamin with a higher absorption iron. I really like New Leaf’s Prenatal Once Daily, with ferrous fumarate iron. But I can only find that at Country Store Health Foods, so if I run out, I use Solgar Prenatal Nutrients from Amazon (that is an affiliate link- if you make a purchase, a small percentage goes to my blog). Solgar’s prenatal has ferrous bisglycinate chelate iron, which is also a higher absorption iron. I digress. Here’s the thing: we’ve got to use our own judgement. I’m sure the big name companies that make antiperspirant deodorant, like Secret and Dove, don’t want the FDA at their doorstep. I’m not saying they’ve bought the FDA off or anything like that, but I’m sure they’re doing something and I don’t trust it’s in our best interests. Maybe that’s just the conspiracy theorist in me, but money is money and proof for this rumor about antiperspirants causing cancer would be very bad for business. Just saying. Also, do you really want aluminum clogging up your sweat pores? That doesn’t sound like a good idea to me. In fact, it sounds really bad. We have sweat pores for a reason, and filling them with a metal…I’m just picturing aluminum foil balled up in my armpits and soaking into my skin. I realize it’s not the same thing, but how different is it really? This isn’t an affiliate link. But if you use it and make a purchase, I will get some primal pit points that will give me a discount as well. That’s beneficial for me because I do use this product all the time. My pits are aluminum free. Or you can get a limited selection of scents here: Primal Pit Paste on Amazon (that is an affiliate link, so once again, if you make a purchase, a small percentage goes to my blog). If you click through the color options, you’ll see the scent options Amazon carries. I was just going to ask you what this stuff was called again! I’m not convinced that there’s a cancer-antiperspirant link, but I know one thing for sure–aluminum-based antiperspirants irritate my skin. And there is nothing less attractive than the monkey-scratching-her-own-armpit look. 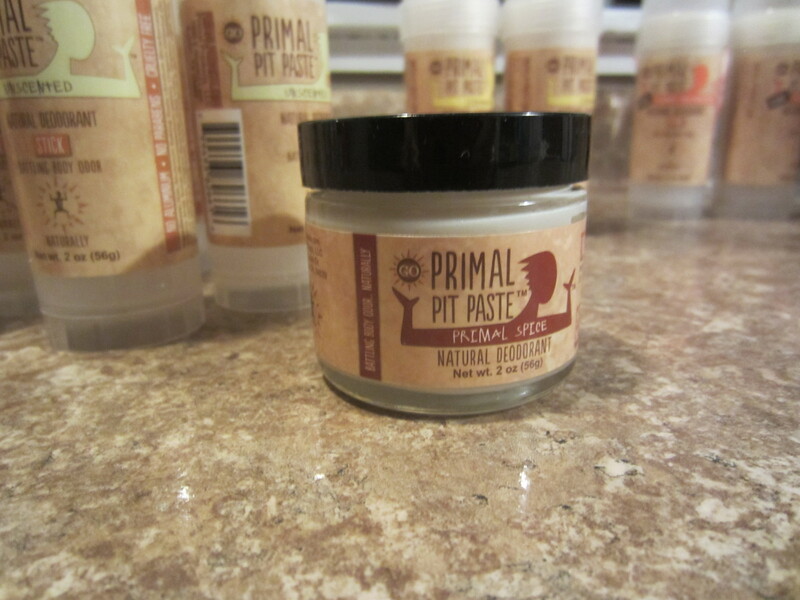 By the way, Primal Pit Paste does have a sensitive deodorant for those who don’t react well with their normal line. I don’t know how well it works, since I’ve never tried it. But they do have samples too, so maybe start with that and a sample of one of the other scents (I love the spice, the orange creamsicle, and lemonade). Or vice versa.